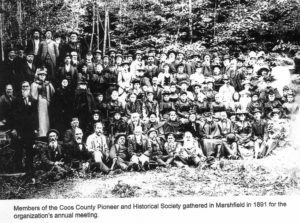 Members of the Coos County Pioneer and Historical Society gathered in Marshfield in 1891 for the organization’s annual meeting. The Coos County Historical Society was founded on November 5, 1891 as the “Coos County Pioneer Association.” It is the second-oldest historical society in the State of Oregon. The organization initially focused heavily on documenting the experiences and accomplishments of the area’s earliest white settlers. Membership in the society was restricted to Euro-Americans who had resided in Coos County before 1868. One member from each area was selected to gather information about early settlers’ experiences and observations while traveling to and living in Coos County. By 1894 there were 139 members. Four years later the society published Orville Dodge’s A Pioneer History of Coos and Curry Counties, which is still a standard reference for the earliest period of white settlement. The existence and culture of the local tribes was acknowledged and described to some degree. Through the early 1900s the Society continued to focus on “pioneer” families and sponsored well-attended annual reunions. Each reunion typically lasted three days: the 1892 event featured business meetings, grand orations, musical performances, splendid picnic lunches, hearty dinners, a grand procession, and boat trips to inspect construction of North Spit’s north jetty and the Coos River quarry. By the 1920s the organization appeared to be in decline. Many of the original members had passed away. To attract new members the by-laws were amended to extend membership to any white person who had resided in Coos or Curry Counties for at least 25 years. To accommodate the faster pace of modern life, annual meetings were reduced to a single day and opened to the public. The organization continued to focus on commemoration of “pioneer” history. In 1941 the name “Coos-Curry Pioneer Association” was adopted (Curry County, just couth of Coos County, had no separate historical society at the time). Voting privileges were restricted to regular members who had resided in Coos and/or Curry Counties for at least 40 years. Associate members could pay dues and support the Association’s activities, but had no vote. The historical society museum was located in North Bend from the late 1950s thru 2014. By 1943, the Association recognized the need to collect, preserve and provide organized displays of historic photographs, tools, clothing, documents and other items that many area families had preserved from earlier generations. The membership voted to create a museum of pioneer history, and removed all restrictions on membership to encourage broad support and involvement. The organization name was changed to “Coos-Curry Pioneer and Historical Association.” Fundraising for the proposed museum began in earnest following World War II, and the society instituted a system for recording the source of donated artifacts. The Coos-Curry Pioneer and Historical Association Museum opened in Coquille, the county seat, in July 1947. The 60-foot-long one-storey building was narrow and unheated; at a cost of $1,695, its construction almost depleted the organization’s treasury. The museum was open one day a week, operated by association volunteers. More than 400 items were donated during the next 10 years. In the early 1950s, the Society commissioned the writing and publication of A Century of Coos and Curry, to update Dodge’s Pioneer History. The new book was published in 1952, written by Emil Peterson with the assistance of Alfred Powers, Dean of Creative Writing at the University of Oregon. The book remains a classic research resource. Also in 1952, the Society decided to seek a new location for the museum, in a town closer to Highway 101. The Coquille site had attracted disappointingly few visitors and income was insufficient. The push to find a new location intensified after a neighboring facility caught fire and slightly damaged the museum building. Creation of a fire-proof facility became a priority. The second museum site, in North Bend’s Simpson Park, was donated by the city of North Bend in response to a general solicitation by the Association’s Board of Director for a site anywhere along Highway 101. The city provided the land free of charge on condition that the proposed museum building would revert to the city if museum use ceased. A group of volunteers constructed the new, concrete-block building in Simpson Park in the summer of 1957. The “Coos-Curry Museum” opened in January 1958, and the building has continued to serve as a museum ever since. From 1958 to the present the Society and museum have operated in the same concrete block building, with continuous community support and an ever-expanding collection of artifacts and images. Dedicated volunteers maintained records of all items donated, and assigned accession numbers. The collections included a large number of Native American artifacts, including many locally-made baskets and tools collected from the Coos and Coquille watersheds..
An important partnership with the local tribes was initiated in the 1980s, when the museum’s collection of locally-made baskets was analyzed by a Coquille tribal member for her master’s thesis. In the years since, the museum has worked in close collaboration with the Coquille Indian Tribe and with the Confederated Tribes of Coos, Lower Umpqua and Siuslaw Indians to ensure that museum exhiits and educational programs provide accurate and appropriate representation of their cultural history. 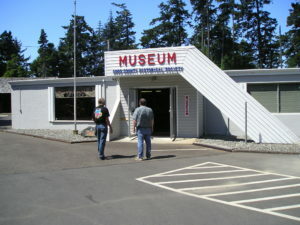 By the late 1990s, the museum facility in North Bend was clearly obsolete, and the organization’s financial prospects faced significant logistical problems. The museum building attracted fewer and fewer visitors because the city center of pedestrian and business activity had moved away. The limited staff and the fifty-year-old building’s floorplan presented constant obstacles to collections management. Storage space was at a premium, while antiquated lighting and heating systems rendered the exhibit space unpleasant. The building offered no room for audiences or public programs, and in fact had no publicly accessible restroom. The society lacked the resources to improve or replace the existing facility, or to build elsewhere. 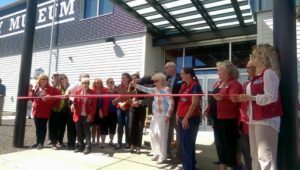 Governor Kate Brown and other dignitaries cut the ribbon for the official opening of the Coos History Museum in September 2015. A profound transformation was triggered in late 2000 when the Coos County Historical Society received a private, unsolicited donation of stock worth more than $800,000, to be used for construction of a new museum. The donor stipulated that the new building be located along Highway 101. The city of Coos Bay first offered to give the Society a quarter acre on the block-wide strip between north and southbound Highway 101 in the center of town, envisioning the new museum as the trigger for desired redevelopment of the formerly industrial waterfront. Preliminary design work began amid concerns over parking and the long-term adequacy of the limited site. In early 2004, the city secured and offered to the society a significantly larger waterfront parcel which offered significant advantages. In addition to its high visibility and easy accessibility, it provided ample room for parking and future expansion. Unlike the earlier site, it was directly on the waterfront, presenting extraordinary opportunities for waterfront interpretation, encouraging community gathering, pedestrian activity and waterfront redevelopment. In accepting the new site, the Board of Trustees reconfirmed their commitment to enhancement of contemporary community life and resolved to design a facility that met public needs, and that could be adapted for use by additional groups and for more active programs. Before moving forward with facility construction, the Board opted to start rebuilding staff capacity and programs, hiring a new Executive Director and the county’s only professionally trained Collections Manager, and launching its new Education program. To emphasize the community-supported nature of the organization, and the breadth of its services, the board adopted the name “Coos History Museum & Maritime Collection” for the new building. Visioning, design, and fundraising began in 2005, and the capital campaign began in earnest the following year. Donations from 550 individuals, businesses and Foundations were received and combined with New Market Tax Credits. The museum opened at its current location Fall of 2015.